It was late November 2012. The beach town I live in was flush with leaping dolphins clad in Santa hats, twinkling lights, and avid boaters welcoming the season with animated decorations. Christmas music permeated the airwaves. The seaside city had been transformed into a magical waterfront wonderland. I was feeling the spirit and wanted to team up with a local charity. But it couldn’t be just any charity. It needed to be something that resonated with and inspired me. Enter Southern California Harley riders. I stumbled across an intriguing postcard about a Santa Harley toy ride for needy children. This was the ticket! This sounded like a blast, and an ingenious way to help kids. Mind you I don’t own or ride a Harley. I just knew I wanted to do this. I really had no idea what I was getting into. It just sounded too good to pass up. 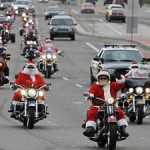 Somewhere between 75 and 100 Harley riders and passengers were told to gather at a nearby pub at 7am on Christmas Eve morning. The only requirement was that we had to dress as Saint Nick, Mrs. Claus or Santa’s helper. I donned a brand new Mrs. Claus costume that I found on eBay, complete with long shiny, stiletto black boots. 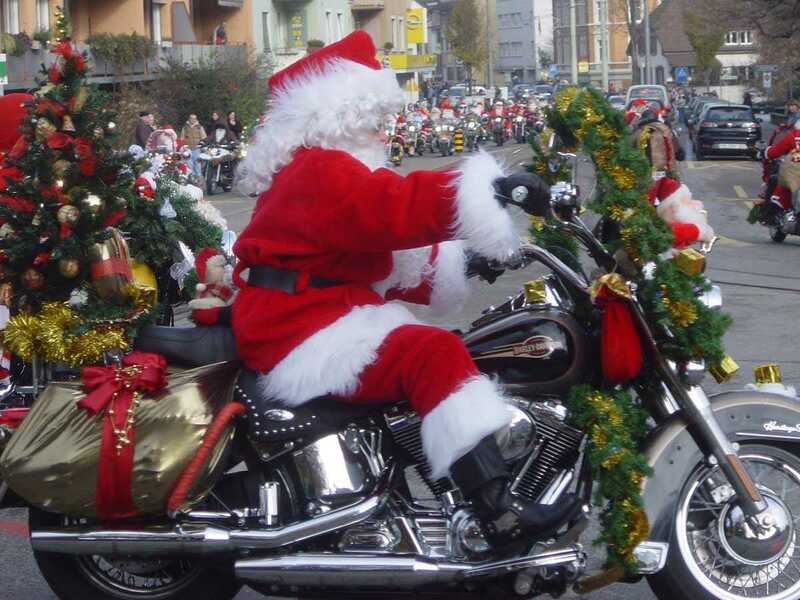 As I pulled up to the parking lot, dozens of Harley-riding Santa’s were posing for a group photo. I captured the moment on film, and joined the festivities. We were treated to hot coffee and a delicious breakfast buffet, courtesy of Fitzgerald’s Irish pub. With full tummies, and warm toes, we began loading hundreds of toys that had been collected over the past two months, into knapsacks and bags. We filled the back of two U-Haul trucks with the colossal stack of bulging sacks. Then, after a looooong thundering roar, (that only a herd of Harley’s could make) we were off. And dare I say, this endless caravan that spanned for miles gave Santa and his reindeer a ride for their money. 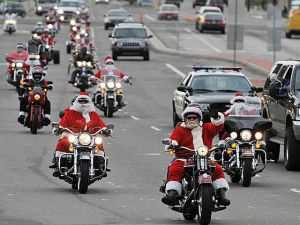 Imagine for a moment….. 85 big, burly, Santa’s and dozens of elves, with festive helmets and long leather boots, riding through the interchanges of Southern California on chrome plated, boisterously loud Harley Davidson bikes. We rode single file – in a caravan through the streets, boulevards and five lane freeways of Orange County, CA. Every rider was decked out. It was an array of Red Velvet, long white curly beards, leather Santa gloves and festive helmets. The elves were clad in green and red felt costumes with funny drooping hats and pointy green shoes. What a sight! As this convoy rode through the highways and byways we literally stopped traffic! It was spectacular. People of all ages and walks of life literally stopped in the middle of whatever they were doing, last minute shopping errands, talking on their phones, jogging, eating, whatever. They looked on in wonder to marvel and gasp at the illustrious sea of Santa’s. And remember that Southern California freeways and streets are typically jam packed with the hustle and bustle of hurried, impatient drivers focused on getting to their destinations as quickly as possible. They certainly don’t have time or patience to stop for anything that’s going to slow them down. But THIS was profoundly different. It felt like we were filming a slow motion movie. Drivers fought to pull over to the shoulders and watch in awe –as the caravan of Santa’s were taking over the 405 freeway. Viewers were star struck, grabbing their Smart phones and digital devices to capture as many images and videos as the moment would allow.After spreading laughter, love, shock and awe through the streets we headed for our main destination- The Orangewood home for Children.This part of the journey was dramatically breathtaking- A true moment in time! We climbed off our Harleys’, lifted oodles of bulging toy-filled knapsacks over our shoulders and ho-ho-hoed our way to the front. We delivered hundreds of sacks stuffed with games, toys and bikes to the awe-struck children. But it wasn’t going to be over anytime soon. We drove around the building to a courtyard in the back, and greeted the children with red and green lollypops. The braver kids that dared were allowed to climb aboard one of the dazzling machines. A low rumbling thunder was interspersed with the sounds of exhilarated children squealing with joy. After about an hour or so of action packed activity the kids were beginning to fade. It was time for us to venture back. We formed our parade once again and took a detour through the Orange Circle in historic downtown Orange, drove in the slow lane of the Garden Grove freeway and meandered through a couple obscure side streets. We even got some waves and claps from a few homeless people! We ventured back to the coast and rode through the charming seaside town of Balboa Island, tossing out candy and smiles to passerby’s of all ages. We stopped for pictures on a number of occasions. 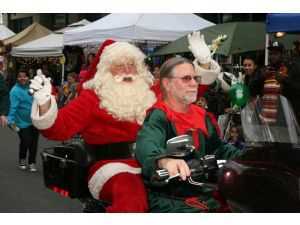 We rode North on Pacific Coast highway to Main Street in Huntington Beach to for a final parade of sorts. Then it was back to the pub’s to decompress and enjoy a hot lunch. If you are a small business owner trying to market on a shoestring budget, you’re not alone. You don’t have to have all the bells and whistles in place to host a charity event. It just takes a little creativity. Ask your Facebook fans for ideas, or hold a contest. There are no bad ideas. Give the top three ideas a free service or product. Make sure to take lots of photos of the event so you can blog about it later, and maybe even use them to create promotional calendar, and inspire other small businesses to follow your footsteps.